Director Mike Hodges had no idea his first film would be such a success. Adapting Ted Lewis’s book “Jack’s Return Home,” Hodges wrote the script, cast the actors, found the crew and locations, filmed and edited the movie in only eight months. But the movie became an instant success, with Michael Caine as the titular cold-blooded killer and an equally killer score by then up-and-coming jazz musician Roy Budd. Almost 40 years after the release of the film, Silva Screen Records is putting out a reissue of Budd’s score-work as the first installment of a reissue series of Roy Budd’s catalogue of work. The score also includes several tracks of dialogue – perhaps as a reminder of how threatening Michael Caine can be when he wants to (even if you only hear his voice). The 28 tracks on the album span almost 54 minutes and cover a range of atmospheres and emotions – from intense action (the driving rhythms in the latter half of “Manhunt” sound like many pairs of running feet backed up only by a few low piano keys) to the laid back cool determination that Michael Caine’s Jack Carter represents (“Getting Nowhere In A Hurry,” the final, and possibly best, track on the album shows Budd’s jazz roots). Interspersed throughout are segments of dialogue from the film. These snippets of dialogue, along with songs like “Love Is A Four Letter Word” and “Livin’ Should Be This Way” make the album feel like an audio tour of the film – and, by extension, the 1970s – rather than simply a collection of music. The jazz riffs on “Plaything” displays the kind of tough-but-cool gangster vibe that many films since have attempted to duplicate. Even those who may not have seen this 1971 film are sure to find some enjoyment listening to the tracks collected on this album. 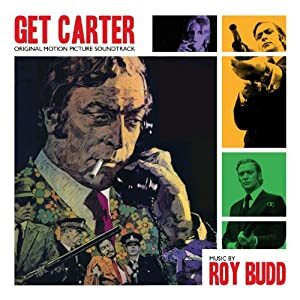 No user commented in " Music Review: Get Carter Original Motion Picture Soundtrack, music by Roy Budd "